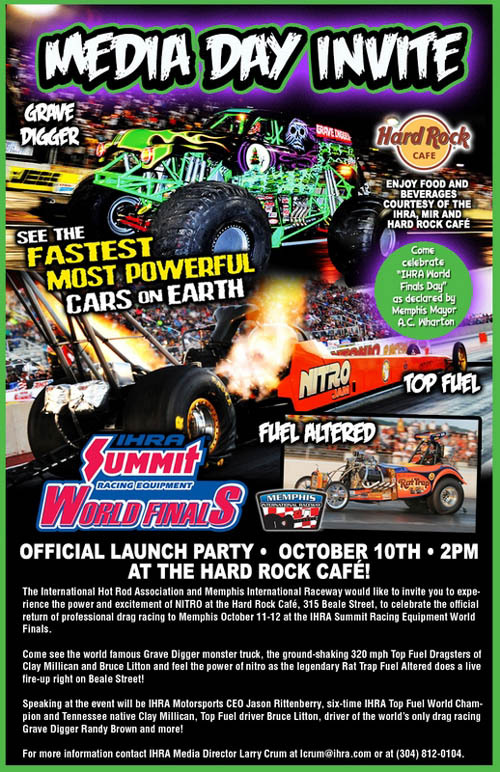 MEMPHIS, Tenn. -- To kick off the International Hot Rod Association's biggest race of the season, the IHRA and Memphis International Raceway will hold a special media day and fan celebration on Thursday, October 10 at the Hard Rock Caf? on Beale Street to ring in the 2013 IHRA Summit Racing Equipment World Finals. The media day and fan celebration will include displays from IHRA's biggest stars including the Top Fuel Dragsters of Clay Millican and Bruce Litton, the world famous Grave Digger monster truck, the legendary Rat Trap Fuel Altered, Chase Huffman's PCD Wraps and Graphics Quick Rod dragster and more. 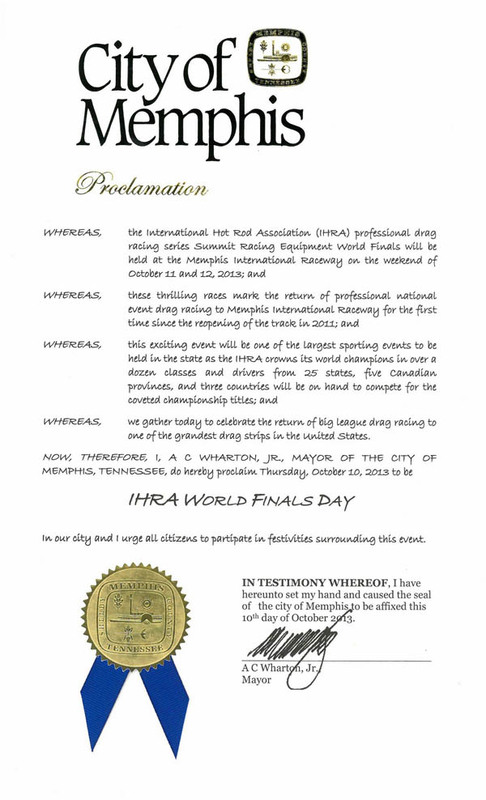 In recognition of the race and the fan celebration to be held at the Hard Rock Cafe on Memphis' legendary Beale Street, Memphis Mayor A.C. Wharton has officially declared in a proclamation that Thursday, October 10 is "IHRA World Finals Day" in the city. Fans are welcome to stop by the Hard Rock Caf? during the afternoon to see the stars of this year's IHRA Summit World Finals at Memphis International Raceway and get your picture with some of the fastest, most exciting race vehicles in the world. The 2013 IHRA Summit Racing Equipment World Finals will take place October 11-12 at Memphis International Raceway. The event will include two huge races as the Nitro Jam professional drag racing series and the Summit World Championships both collide for two huge days of racing. The Summit World Championships will feature two sportsman races crowning 10 IHRA World Champions. The Summit Tournament of Champions and Summit SuperSeries will pit the best sportsman racers from around the world in March Madness-style tournament to determine the champion in 10 IHRA classes. Drivers from 25 states, five Canadian provinces and from as far away as Alaska, Hawaii and the island nation of Aruba will be in competition.